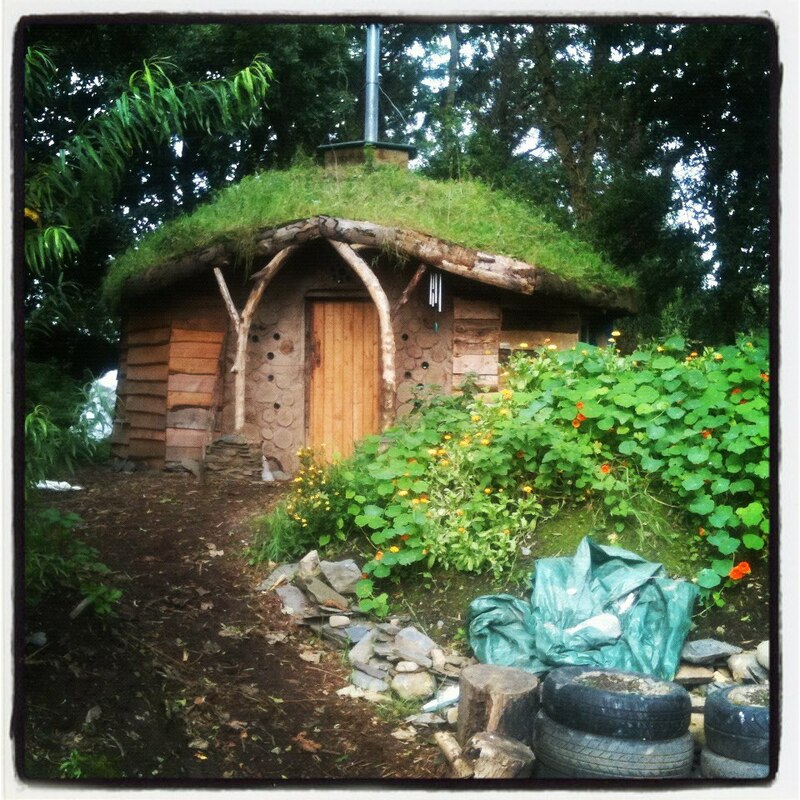 We spent over a year living off grid in a horse lorry, on our friend’s farm in Bangor, Northern Ireland. 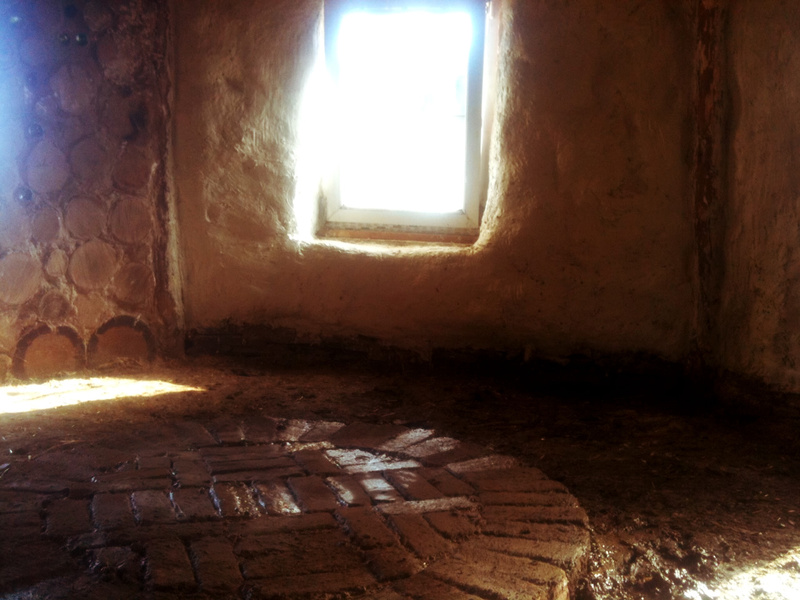 Our adventure was inspired by many things, not least a desire to free ourselves from seemingly endless bills, and also to do things for ourselves. 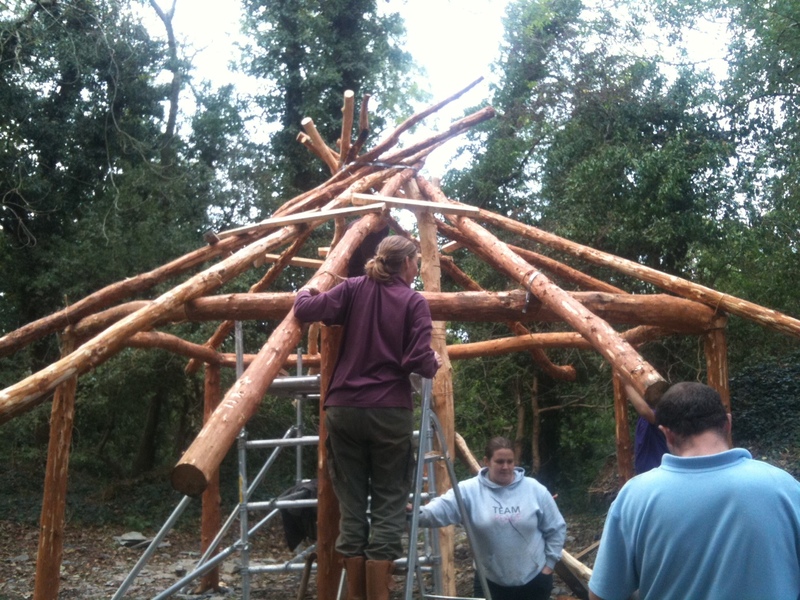 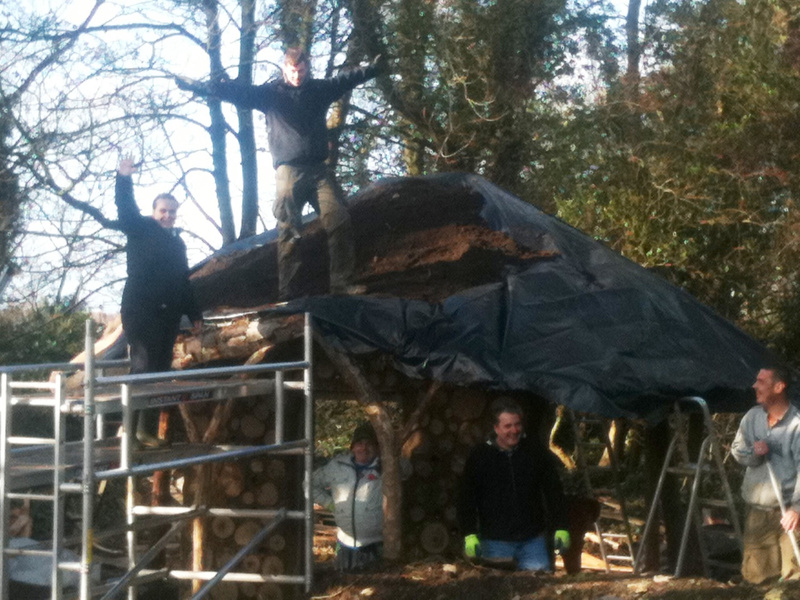 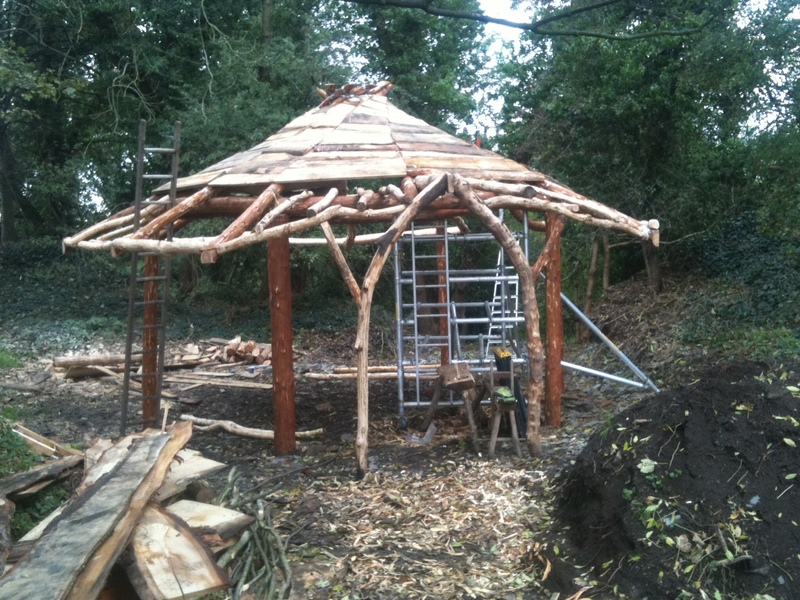 We’d seen Simon Dale’s Hobbit House, and I’d been to Lammas in Wales to work as a volunteer, so we just had to have a go at building a roundhouse in the woods at the farm where we were staying, with help from many volunteers. 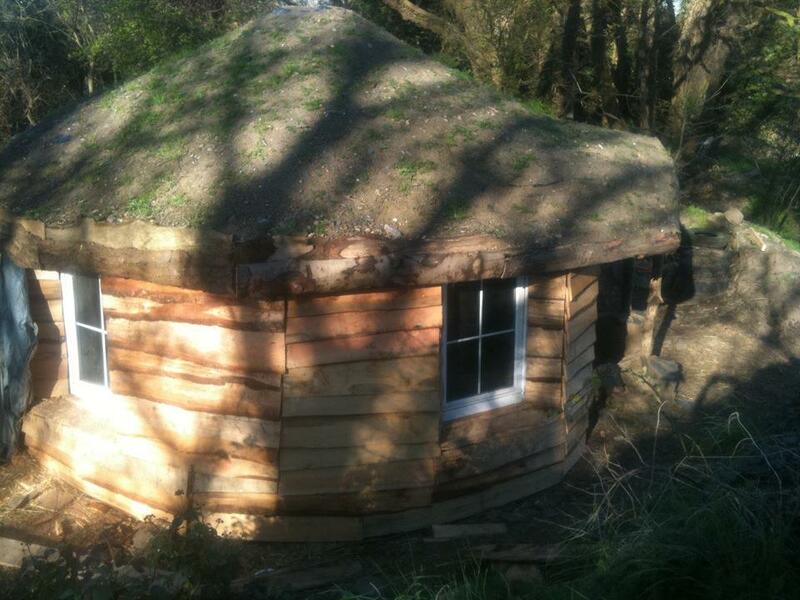 NB – The roundhouse isn’t here at Lackan, it is in Bangor – just in case anyone wants to see it. 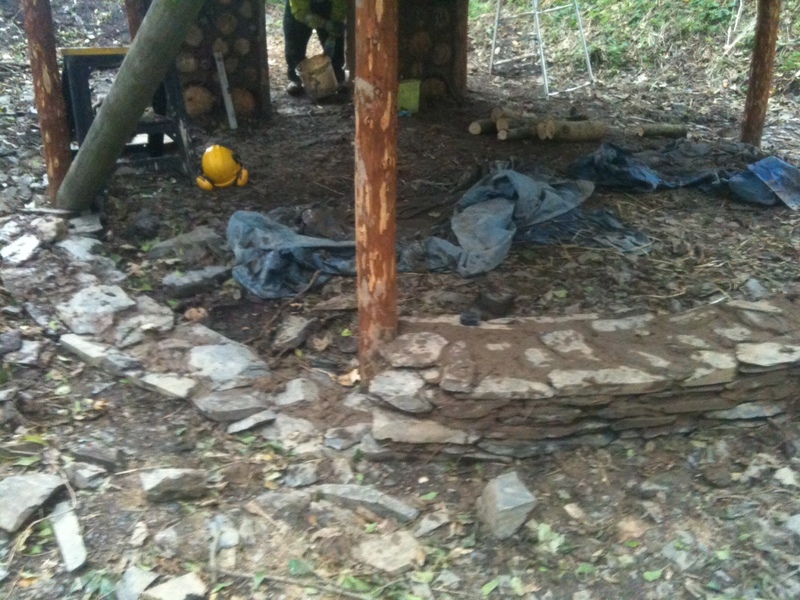 The frame was felled on site, and all the slate for the walls, the mud and straw for the walls, and the flooring was also found there, and the exterior is clad with sawmill waste. 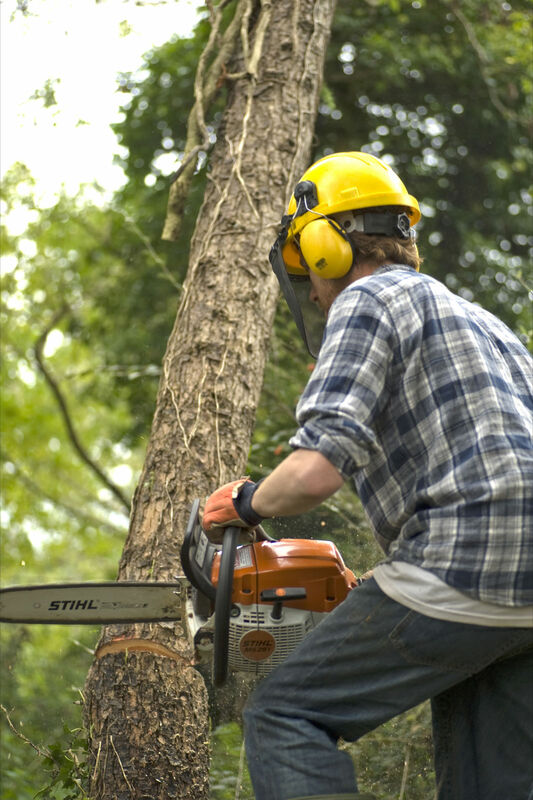 All the other fittings – doors, windows, chimney, seats, are someone else’s unwanted junk. 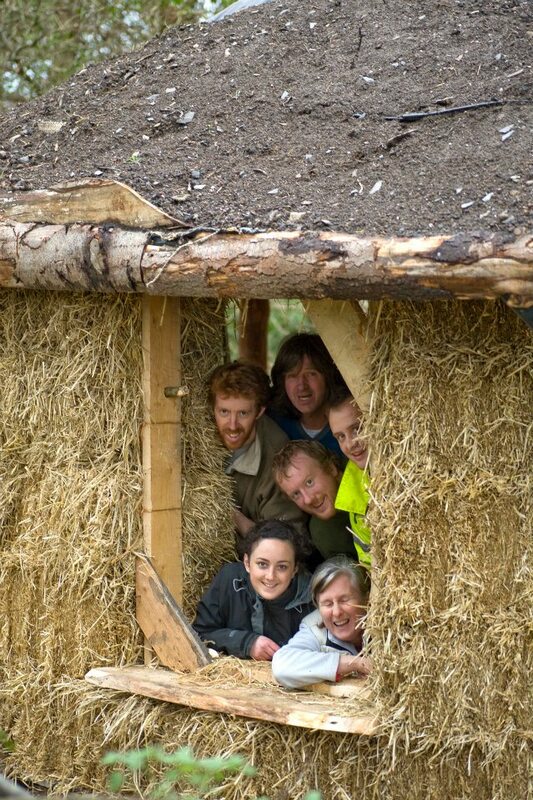 As with all our projects it was a great learning experience, and we relied heavily on making it up, and a fantastic team of visiting volunteers to help it all go together. 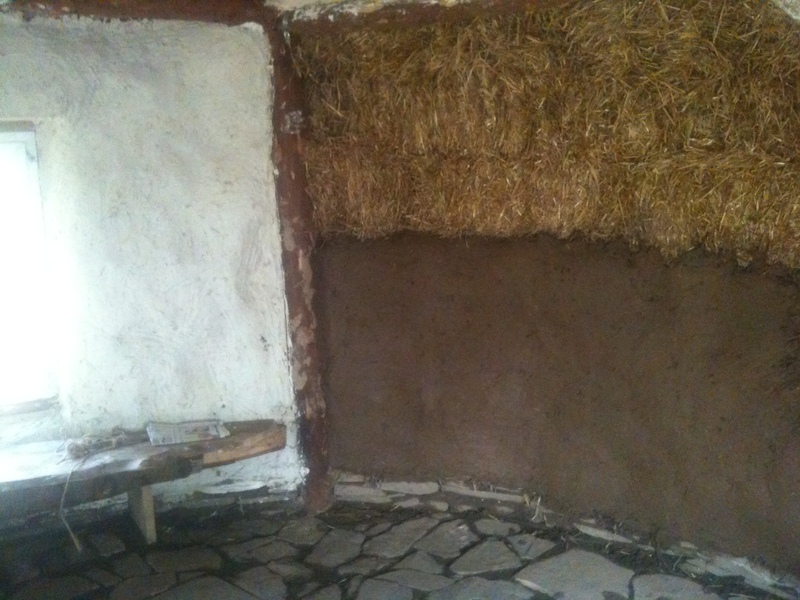 Our first attempt at earth plastering went on rather well, and the floor is finished! 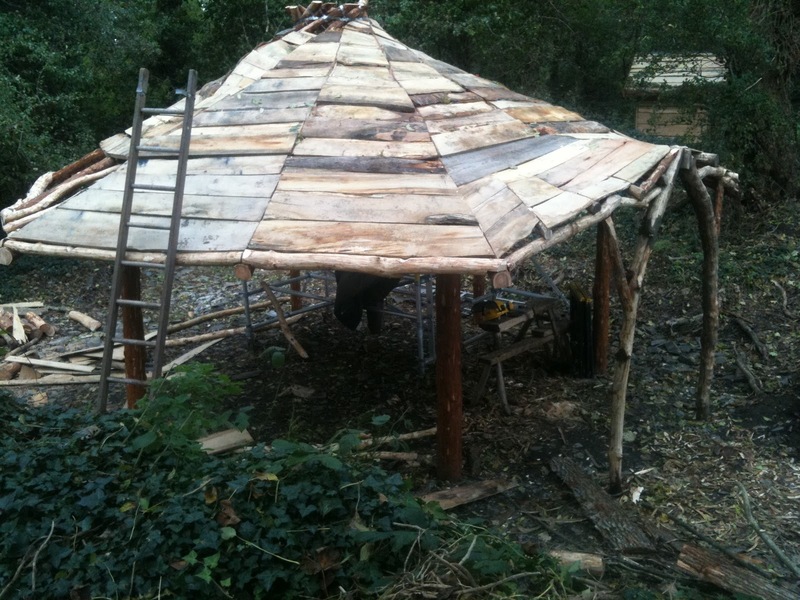 End of the first days floor laying, and it’s all looking good. 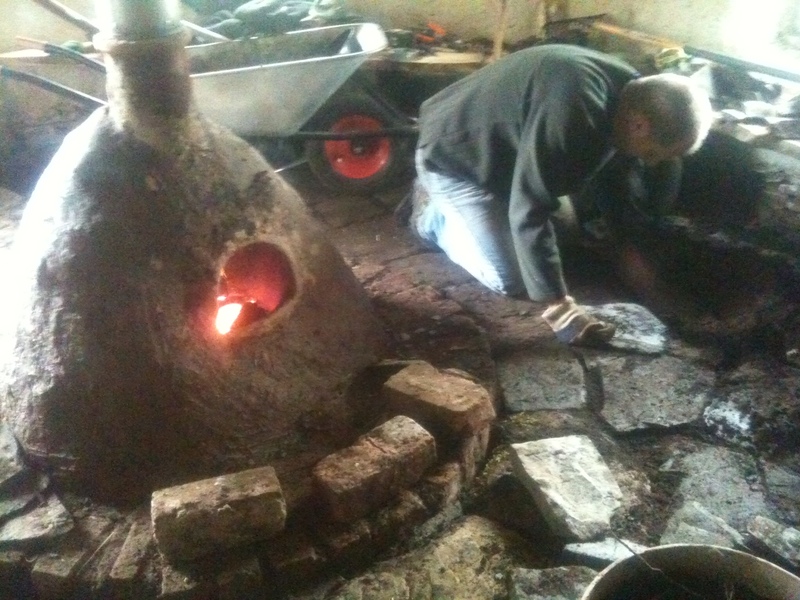 Alexey laying slate floor beside the newly lit fire. 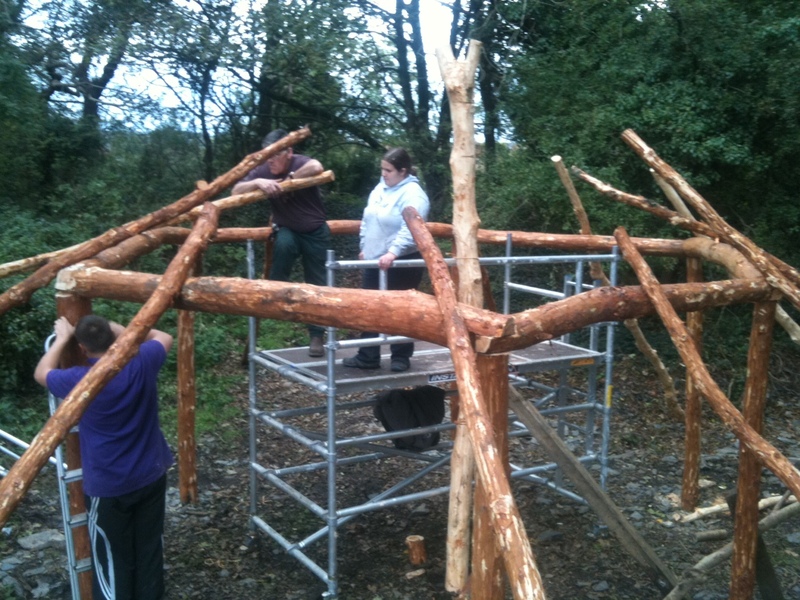 The fire being put together. 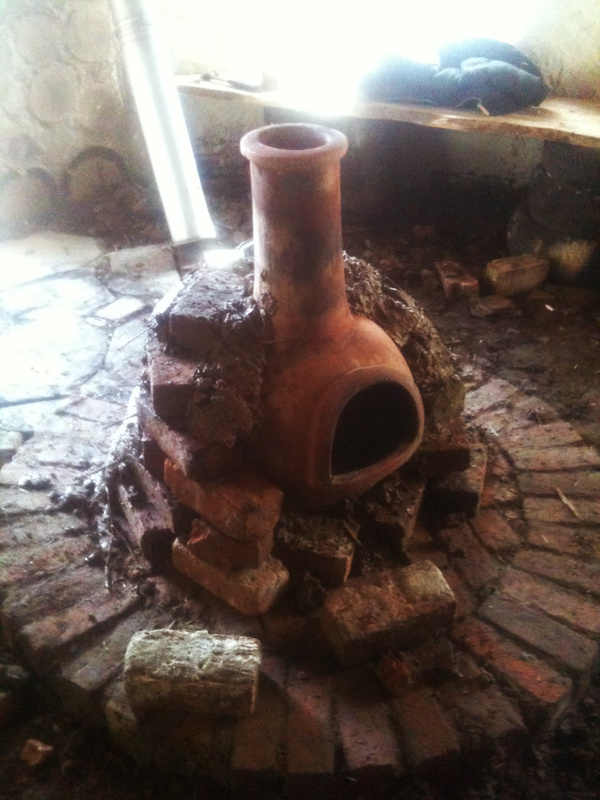 An old clay chimonea, surrounded by bricks, to give it mass, with cob surrounding it all. 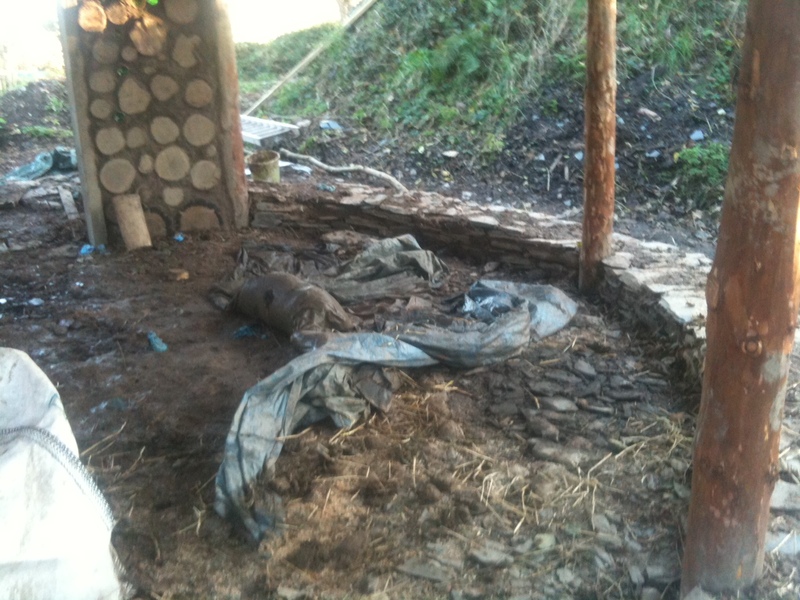 End of the day, 3 walls plastered, and the brick hearth laid, using a clay mix to bond the bricks. 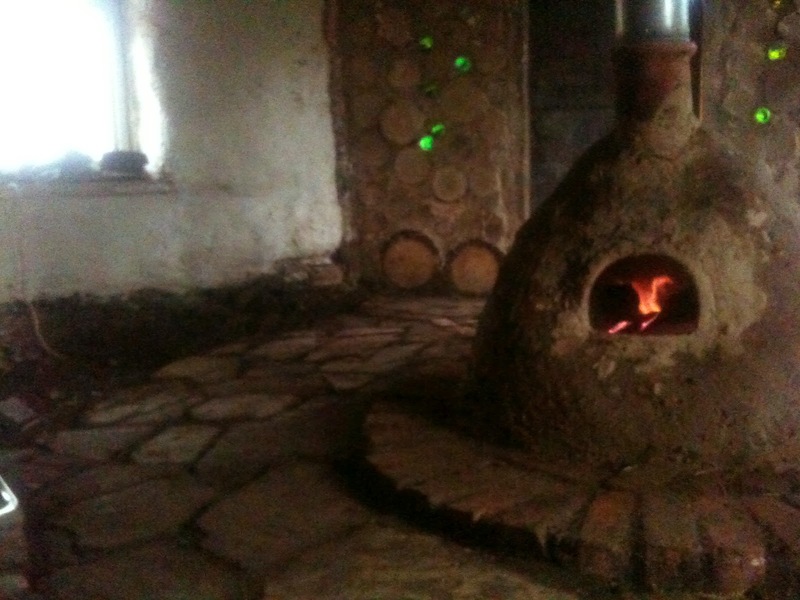 Lots of plastering done, clearing the floor ready for the hearth. 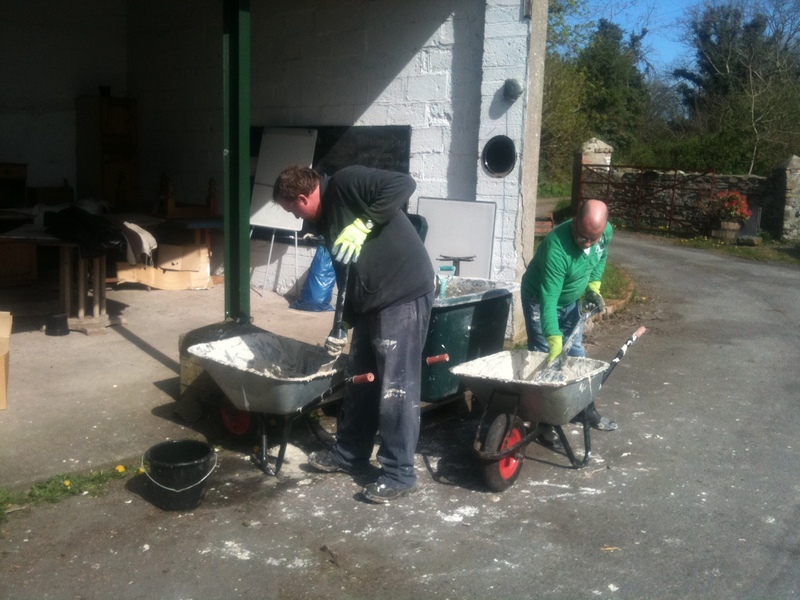 Michael and Mark mixing up lime-hemp plaster. 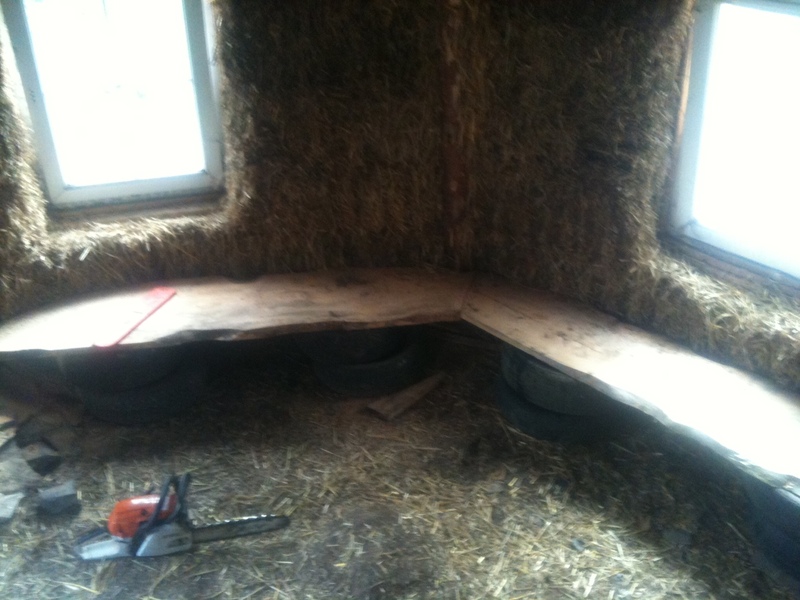 Some larger timber will form the seats around the interior – just fitting them before plastering. 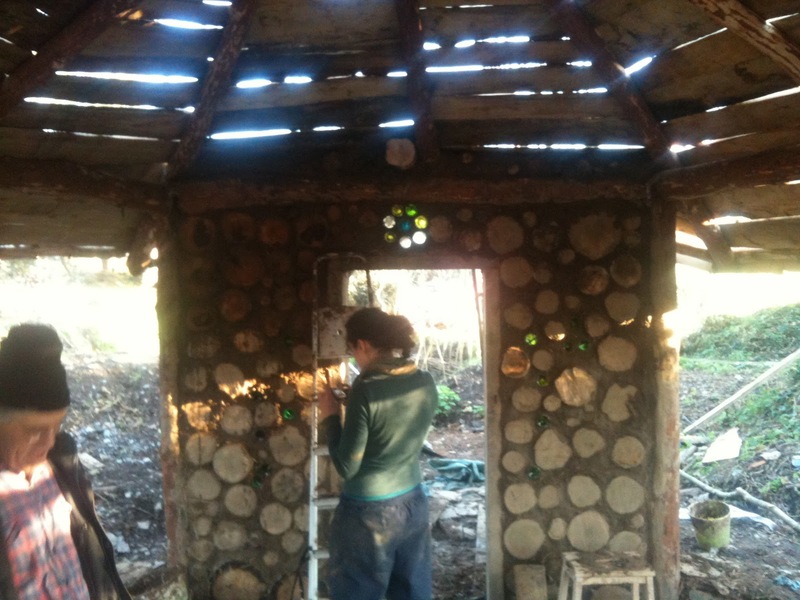 And then, after a 3 month break over winter, we came back and started to clad the outside, using yet more sawmill waste board – mainly Douglas Fir. 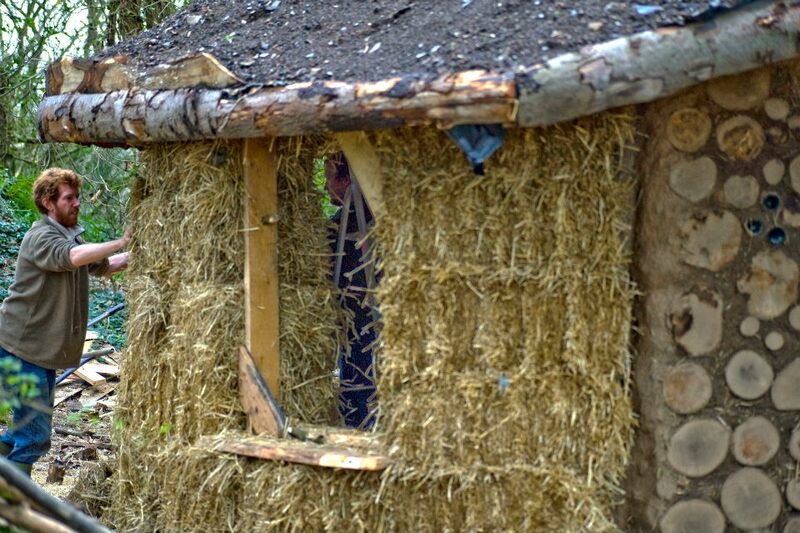 Then there was straw. 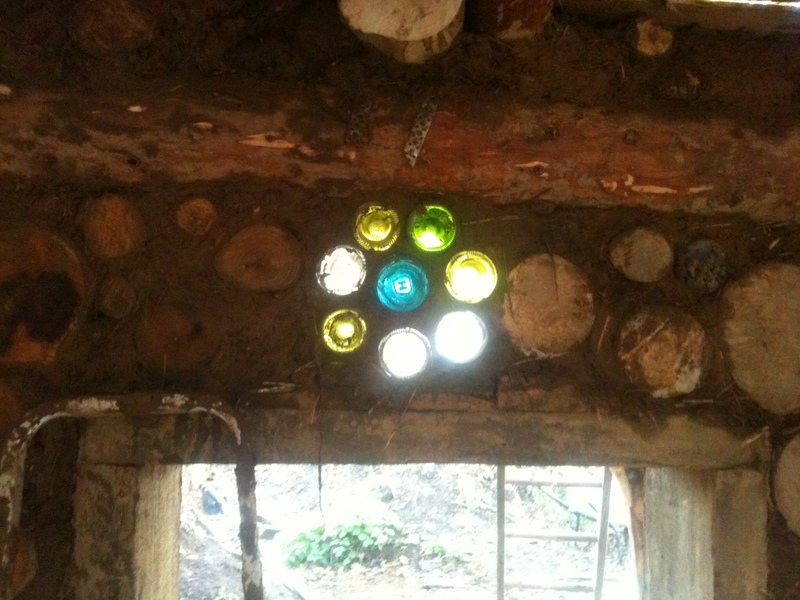 And some window frames….. 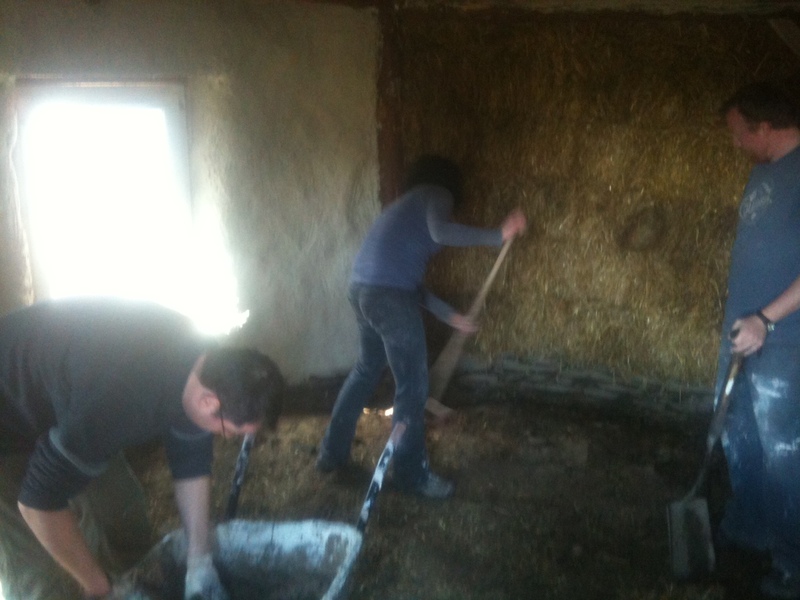 The pond liner goes on over straw, and the team begins to shovel earth up onto it. 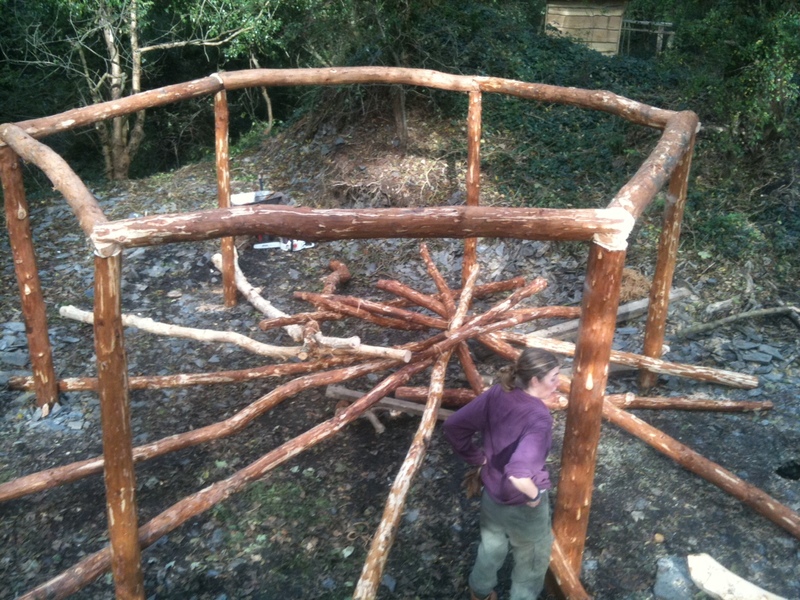 The stub wall is completed. 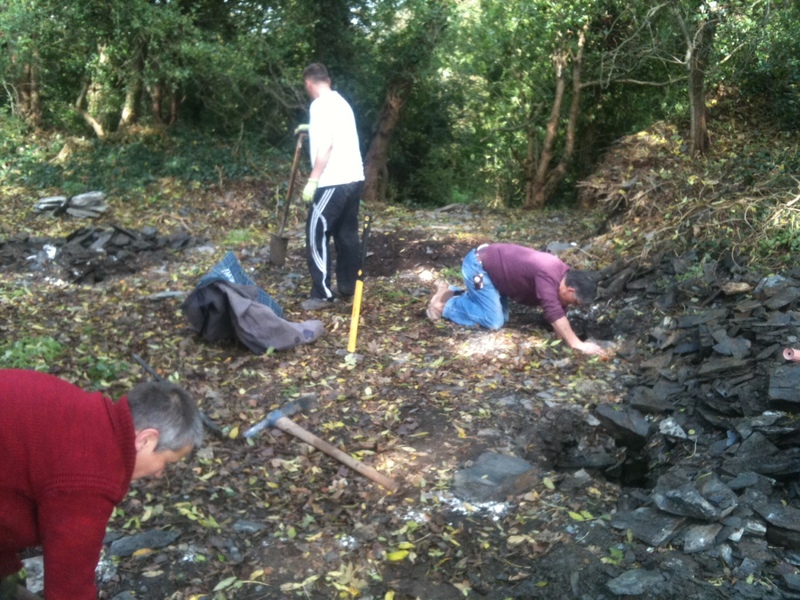 And the cob and slate stub wall is under way. 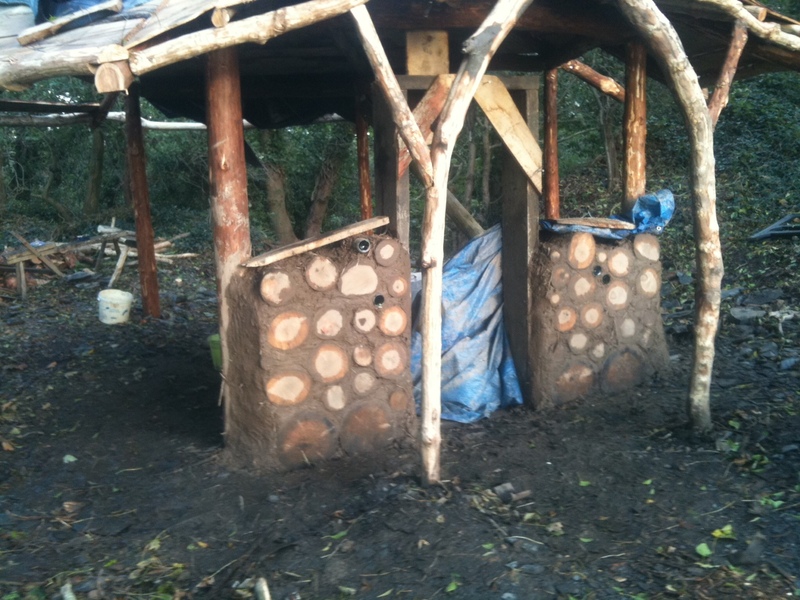 The cob and cordwood front wall starts to go up..
Another day and its nearly there.. 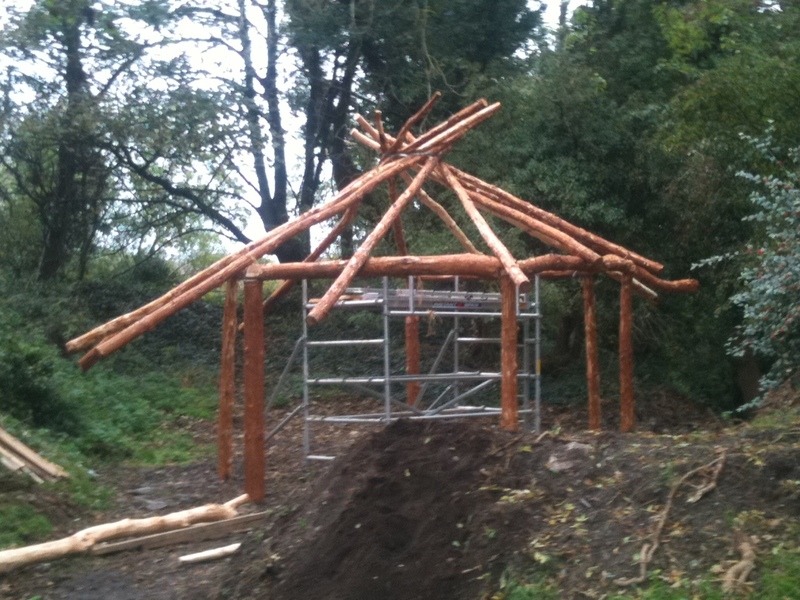 Note for next time – even out the sizes more before fitting the roof. 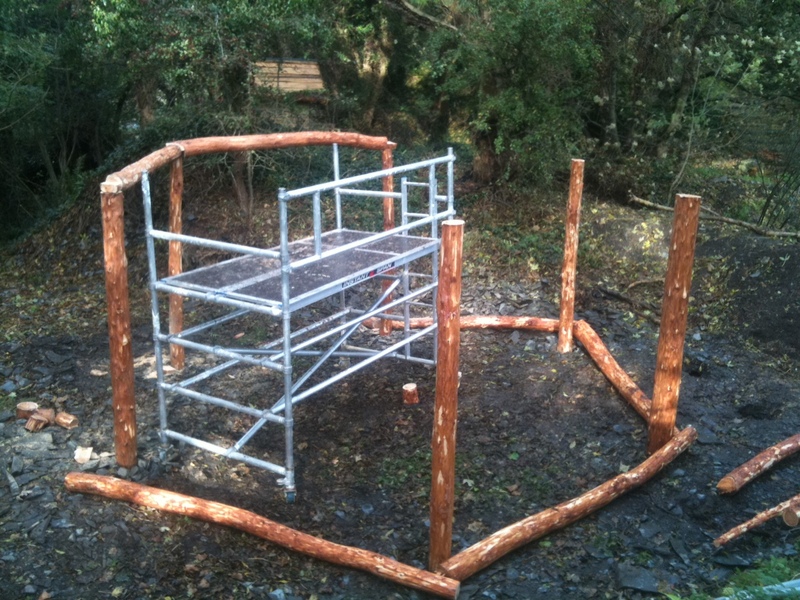 All in place, with a few temporary battens in place (just in case). 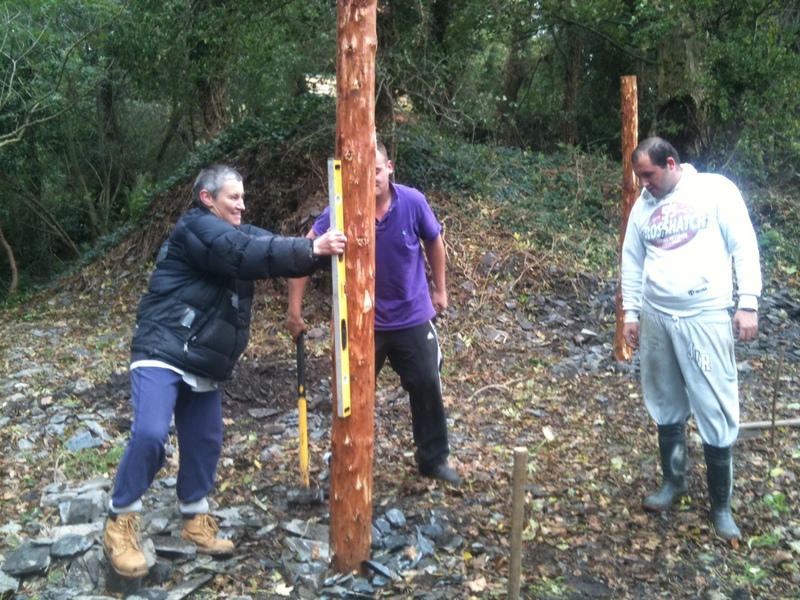 Evie and Wesley oversee as the poles are raised into position. 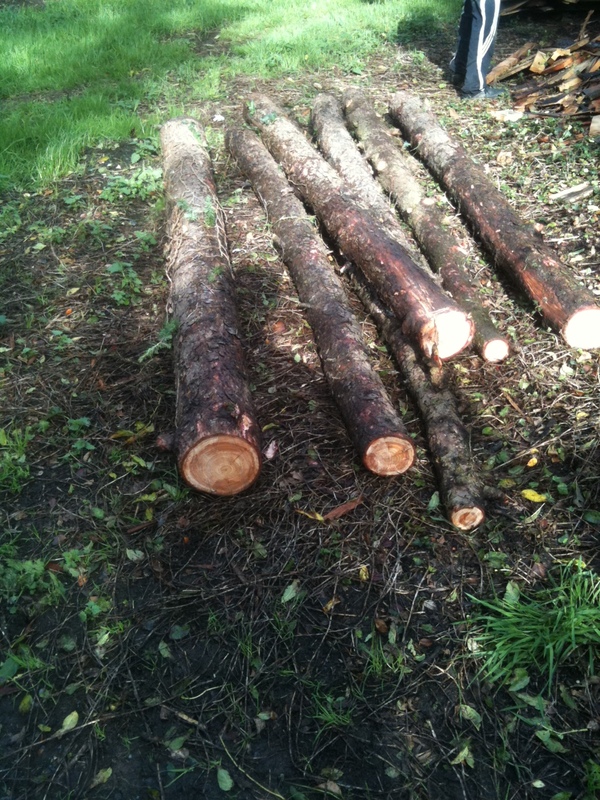 Note *massive* Charlie stick. 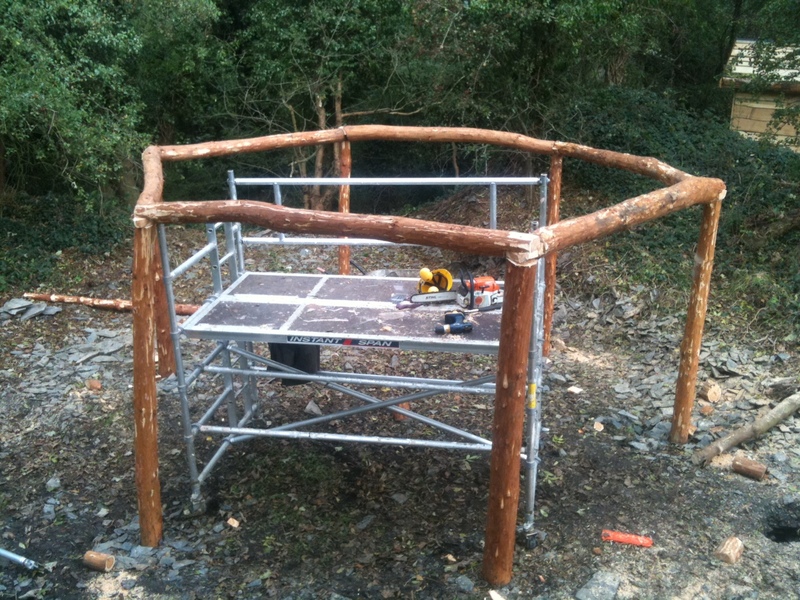 Basic frame in place with all the henges fixed down.